See that? Looks mighty fine, doesn’t it? That is what you get when you make a dinner date with two brands that I loveÂ Primal Kitchen and Applegate. This is not the first time using Primal Kitchen Balsamic Marinade and it will not be the last. Primal Kitchen consistently comes through and shines with their incredible line of tasty and nutritious products. I made sure my pantry is always stocked with their items. This right here is going to be one of those dinners that is on repeat and in regular rotation here at the Give It A Whirl Girl kitchen. My family of 3 ooh’s and ahh’s the entire time eating this gluten-free, low-carb, primal meal made with Primal Kitchen Balsamic Marinade. If you are looking for a simple, flavorful steak dinner then I will hook you up with this amazing recipe that anyone could do. You will be eating like a primal caveman in no time with this paleo meal. This particular marinade is created with a blend of balsamic vinegar, avocado oil, and organic herbs and spices. You will not find any refined sugars in their line of products… none! Two tablespoons of this Primal Kitchen Balsamic Marinade are 100 calories, 1 gram of sugar, and 3 carbs. Primal Kitchen only produces items with simple and pure ingredients… real food to fuel your body and mind. I am a label analyzer and I never spot any odd ingredients whatsoever in the products. They are all ingredients that you are familiar with and nothing funky that you can’t pronounce and have to Google to find out what the heck it is. Here is what is inside theÂ Primal Kitchen Balsamic Marinade. All about that cast iron, man! As mentioned in earlier posts, you will want to give this recipe a whirl in a cast iron pan. I highly recommend going with Lodge Cast Iron on Amazon. These skillets are not only budget-friendly but if you take care of it well and give it some love, it will last a lifetime. This is the only way I will cook a steak now. No more barbeque grill for us here. We get the most tender, juicy steaks here with our trusty ol’ cast iron. Place both steaks in a container large enough to hold both and pour the marinade into the container. Allow steaks to marinate for several hours or preferably overnight. Take 2-3 stalks of asparagus and wrap a piece of bacon around them and create a bundle. Place on a non-stick baking sheet. You may want to cover it with foil. Place the bacon wrapped asparagus in the oven for 25 minutes, or until bacon is done to desired crispness. While the asparagus is cooking, warm 1 tablespoon of Primal Kitchen Avocado oil in a large cast iron pan. When the oil in the pan is warm place the steaks in the pan. They will sizzle if the pan is warm enough. I prefer my steaks medium-rare so I only cook my steaks for a few minutes per side. Be sure to flip the steaks and get a nice sear on both sides. Allow steaks to rest for 5 minutes after taking them out of the pan. Remove asparagus from the oven once bacon is cooked well enough. 25 minutes was enough for me. Serve, eat like a caveman, and enjoy! Wrap mine up in bacon, please! For this roasted asparagus, I went with the Applegate Uncured Sunday Bacon. This was my first time giving this bacon a whirl and my little family of 3 were all impressed. Applegate is another brand of food that I put my trust into. This is another brand that serves up the real deal… real food with real ingredients. This is bacon that you can feel good about putting into your tummy. You won’t find antibiotics in their meat. Their meat comes from humanely raised animals. You also won’t find any GMOs in this bacon. When I choose Applegate I eat with a clear conscience and confidence in my food. Just look at those juicy, tender cuts of meat. When you choose cast iron you choose a non-disappointing steak that is never going to be dried out or tough. Simply cook for a few minutes on each side and allow the meat to rest a few moments before cutting into it. It will retain the juices better when you rest your meat. I truly believe that I could eat a dinner like this every single night and never ever get sick and tired of it. Just give me a big slab of meat and some roasted veggies and I am all set! I was telling my husband that last night at the dinner table. Strip steaks were on sale at Kroger and I had no choice but to grab a value pack of 3 (I am freezing the 3rd steak for a future dinner). I can never pass up a great deal on a good cut of meat. If you would like to create this meal for yourself at home I provided some shopping links below so you can stock up. At the time of writing, the Applegate bacon is appearing to be out-of-stock on Amazon but you might be able to locate it at your local Kroger store. 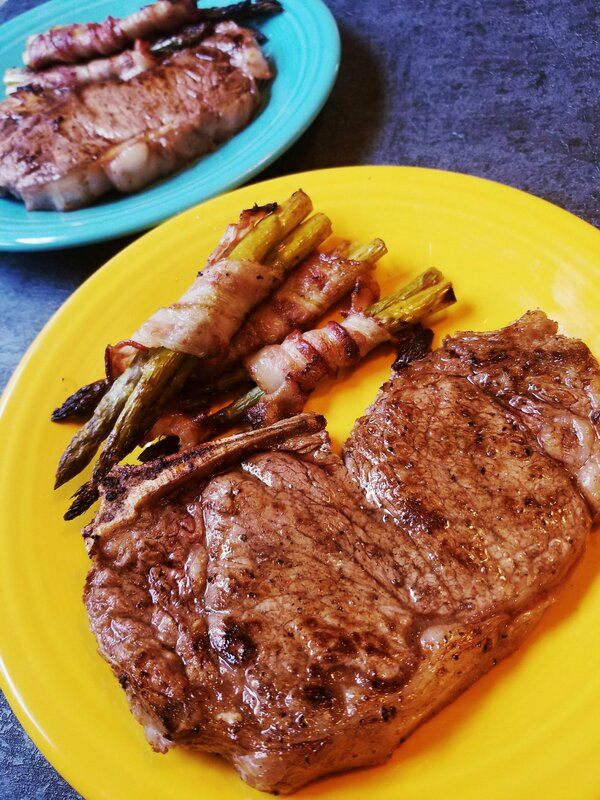 This entry was posted in My Cooking Journey, Recipes and tagged Applegate, asparagus, avocado oil, bacon, balsamic, cast iron, gluten free, glutenfree, low carb, marinade, meat, non gmo, paleo, primal, primal kitchen, roasted, simple, strip steak. Bookmark the permalink.